Mature Height 40 - 60 ft. Mature Width 40 - 60 ft. 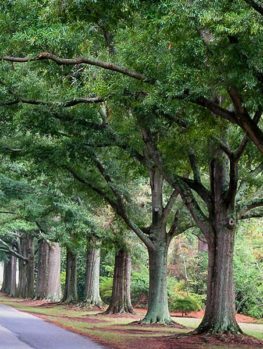 In the southeast, shade trees can be hard to grow, with the heat and drought conditions that are common. 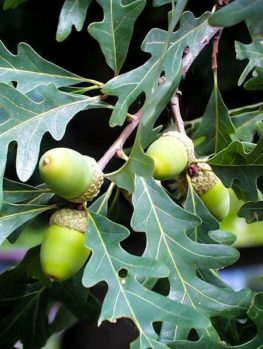 The Sawtooth Oak is an Asian oak tree that produces a heavy crop of acorns for wildlife, as well as making a handsome, quick-growing tree suitable for larger gardens. Before you know it your Sawtooth Oak will be a stately tree and provide cooling shade in the hottest of regions. Sawtooth Oak grows quickly into a large, wide tree with yellow leaves in fall. It produces big crops of acorns from an early age so it is a great tree to grow for wildlife, who love the acorns. The perfect tree if you need to quickly grow a shade tree in your garden or if you support wildlife in your area. 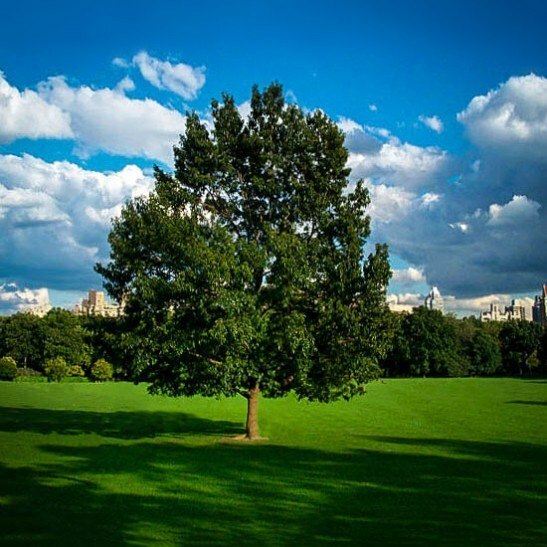 Sawtooth Oak is a tree from the Far East which has become widely grown in America because it is one of the fastest growing shade trees for warmer states. 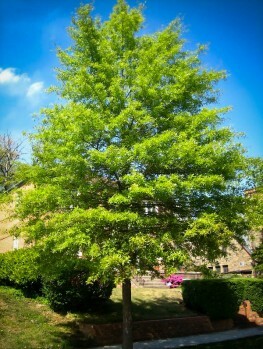 If you need shade in a hurry, this tree is a good choice for almost all soils and conditions. It makes an interesting and different specimen tree for a lawn or in the background of your property. If you like to support local wildlife, then the Sawtooth Oak is a wonderful tree to grow because in a few years it will begin to produce regular crops of acorns that are loved by birds, including the Wild Turkey. It can be grown as an individual specimen, as a privacy screen or added to natural wooded areas you may have on your property, where it will help to increase the population of birds, turkey, deer and wild pigs. 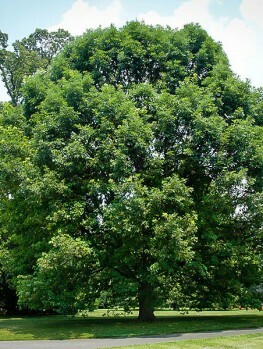 Sawtooth Oak (Quercus acutissima) is native to China, Japan and Korea. Sawtooth Oak is widely grown in the eastern United States and has joined the natural forest in some places. 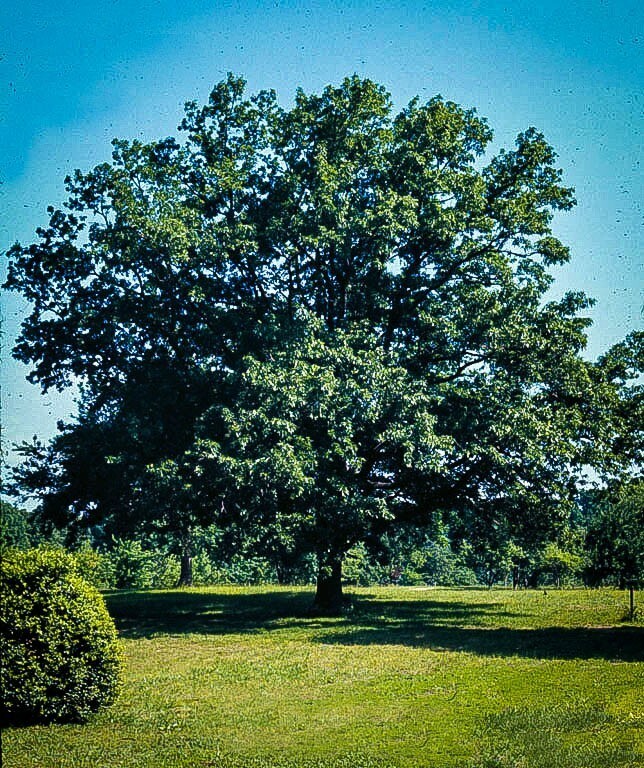 It was originally planted to provide acorns for wildlife, as it produces a larger crop of acorns than the Red Oak and other native Oak trees in America. 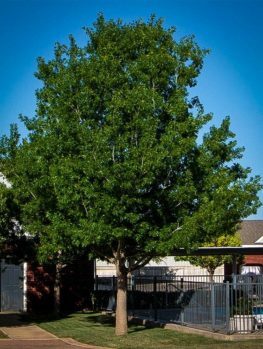 Young Sawtooth Oak trees will grow up to 3 feet in a year, so if you need a shade tree in a hurry this is the tree to consider. Once it has made a good size the growth will slow down, and unlike some other fast-growing trees the Sawtooth Oak will mature into a beautiful tree that will live for many decades. It is tolerant of both wet and dry conditions, poor soil and urban conditions too. 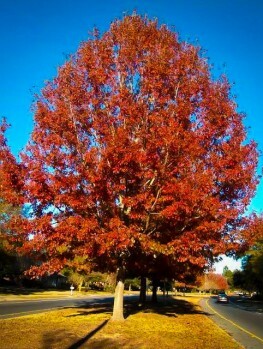 It is a good low-maintenance tree that has no serious pest or disease problems and needs no particular care. The growths that sometime develop on the leaves are called ‘galls’ and they are harmless to the tree. The insects that produce them are an important spring food for many birds. Some mildew may be seen towards the end of the growing season but it is harmless and the growth next spring will be fresh and clean. 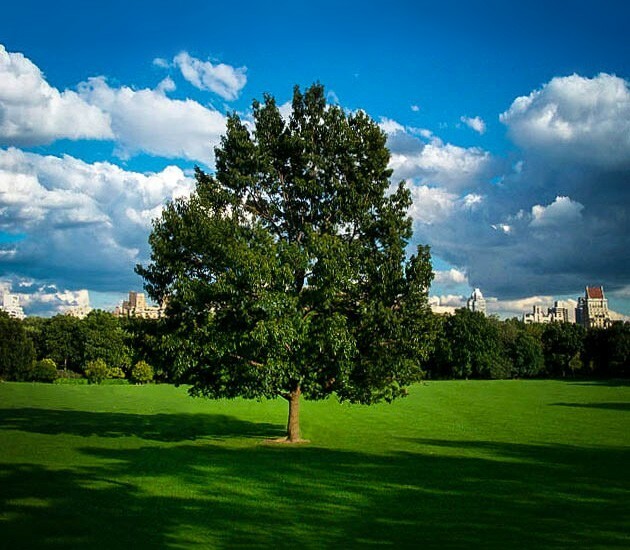 Sawtooth Oak is a medium sized tree reaching 35 to 45 feet in height with a spread of 35 to 50 feet, making it a great shade tree choice when coverage of a large area is needed from a tree that is not too tall. The sturdy trunk is grey-brown in color and mature trees have deep furrows on their trunks. 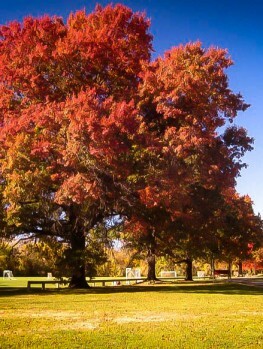 Unlike common oak trees, the leaves are oval and not the usual lobed oak-leaf shape. They are thick and glossy on the upper side and around 7 inches long. The leaf-veins end with a bristle at the edge of the leaf. The leaves emerge in spring a bright and cheerful yellow-green and then turn dark green for the summer. 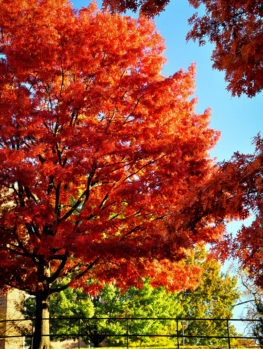 In fall the leaves turn yellow and then brown and stay on the tree for much of the winter, which is beneficial if this tree is being used as a privacy screen. The flowers are insignificant and yellow-green in color, but they develop into acorns one inch long, with a frilly green cup at their base. Young trees often begin to carry acorns when they are only 10 years old and trees produce regular heavy crops in almost all years. Sawtooth Oak grows from zones 6 to 9, so it is a great choice for warmer states where other deciduous trees may not do well. It will tolerate periods of wet soil and also periods of drought. It will grow in most soils but should not be planted on very alkaline soils. If you have alkaline soil, consider growing Autumn Purple Ash, Thornless Honey Locust or the Gingko Tree instead. When choosing a location for your tree, find a sunny spot and allow plenty of room for clearance from buildings and power-lines – 20 feet from potential obstacles. Keep your tree 10 feet or more from paved areas like paths or driveways. To plant your Sawtooth Oak, dig a hole two to three times the diameter of the root ball and mix in some organic material such as compost, rotted manure, rotted leaves or peat-moss. Just make the hole the depth of the pot and break-up the bottom a little. Add some starter fertilizer like superphosphate to get your tree of to a strong start. After you put back most of the soil, firm it well around the roots, water very thoroughly and after the water has drained away fill in with the remaining soil. Staking is not usually necessary. As your Sawtooth Oak tree develops, trim off the lower branches to develop a trunk to the height you need. As they tree grows older the branches will bend down towards the ground so they may need some additional pruning if the tree is near driveways. Otherwise just remove any branches which are making your young tree too crowded and dense. Grow a single trunk as this tree will break in a few years if it has several trunks coming from the ground. Sawtooth Oak is a special kind of Oak and is the only one that will grow this fast, tolerate the same conditions or produce acorns so early. So it must be produced directly from trees absolutely known to be right. Our trees are grown the correct way, from acorns taken from carefully selected trees showing the best qualities of the tree. However, these take longer to produce, so avoid cheaper trees that will only be a disappointment. Other types of Oak tree are not the same at all. We sell only trees that are true to the original form and we have a wide range of sizes to give you the best plant for your purpose. With that said, we are constantly renewing our stock so our customers get fresh, healthy plants so supplies of this tree may be limited. To avoid disappointment order now.